Color/Style Opinions very welcome - Cherry cabinets are so hard! 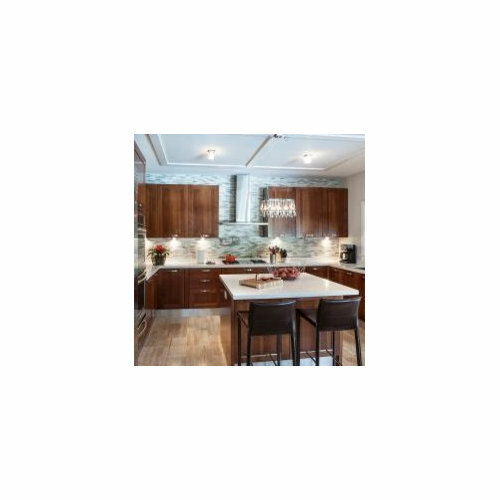 My husband are embarking on a kitchen project and while I'd like to think I have some sense of style, I could really use some advice here. We've got more modern styled cherry cabinetry (which is staying put) and I'm having a heck of a time with pairing new counters/flooring and it's time for an upgrade. As you can see, the prior owners put in a manufactured bamboo floor which hasn't worn well with our dogs and they had a darker, solid surface counter which I'd like to change out with granite/quartz. We've tentatively picked a gray quartz for the peripheral counters and Bianco Antico granite for the center island. I really do like those choices, but I'm struggling with the flooring. 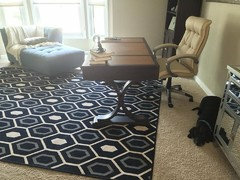 We need something that will wear well (we have three dogs) so we were leaning toward luxury vinyl plank (to be installed in the entire lower level, not just kitchen). 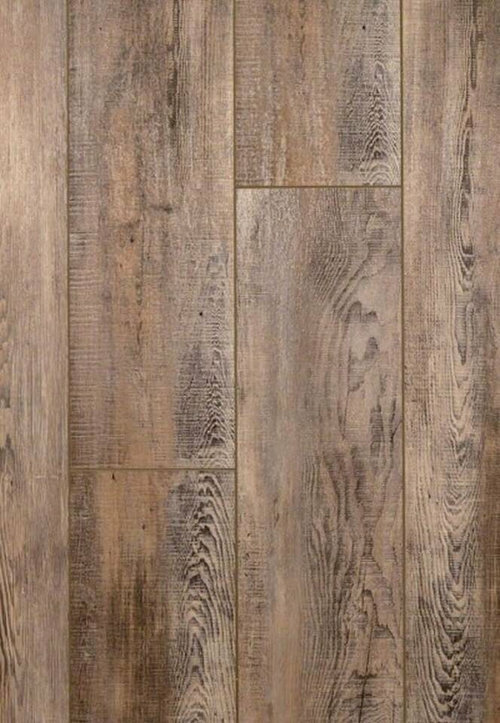 I have a more rustic/woody aesthetic so the flooring I gravitate toward had more of a grainy/earthy look, but now I'm questioning it. It's gray with some warm tones to pair to the cherry. But it may look too far off from the more modern kitchen. Perhaps plainer is better? My big thing is I want the floor to have texture and feeling. The first inspiration photo is how not to do it. 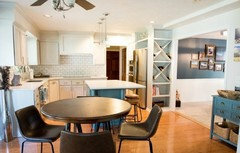 The bluish grey is very contrasting to the cabinets, so both stand out as anachronistic. The second and third inspiration photos are great, so I would look for a flooring just like you chose, something with brownish grey mixed with a peachy tan. 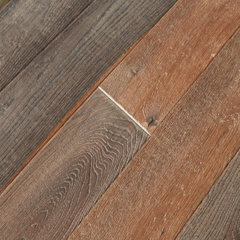 Do you want narrow or wide planks? I have to say I think the second inspiration photo nailed the look better. The floor is more neutral, not as much grain, so doesn't fight with the cabinets as much. However, if you like color and texture, that is a conundrum. Is that your cabinet door against your choices. Seems OK to me. I would stay away from a busy wall treatment and chose a plain backsplash then with a floor and counters with that much going on. Here are some other options to consider. Your cabinets are gorgeous. I think you can use different choices than you are thinking of to give you a more "modern" feeling, and work with other aspects of your home. More white would help this look. 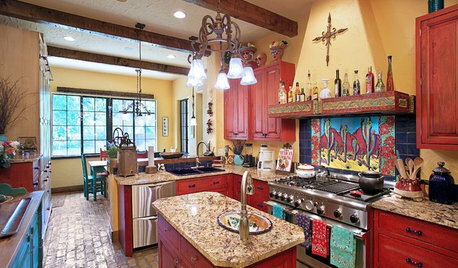 I don't like the busy backsplash here, and would go to a white 2x8 white tile stacked, with matching grout. 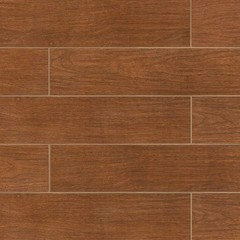 There are wood look tiles in lighter colors as well. I like the darker countertops on the peripherals, with the light look on the island. If you're set on gray floors, I would personally look into porcelain rather than wood. 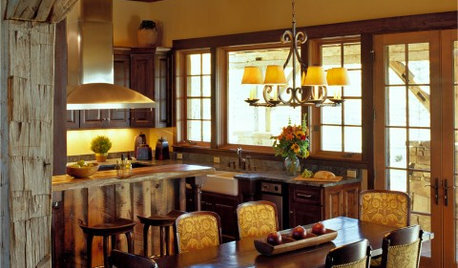 Most gray woods will have a rustic feel to them that will absolutely clash with cherry cabinets. I agree with pinkmountain that the first inspiration pic doesn't feel right. For gray woods, look for even patterning and more subtle texture. My favorite is the last. 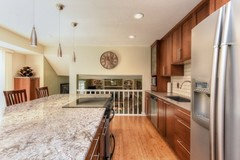 If you're on a budget, changing to lighter floors will allow you to keep the counters assuming you like the counters. However, yellow flooring will vary hugely depending on your light and can look strange if the lighting is not correct. Your cabinets are absolutely gorgeous! 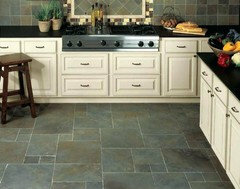 I would similarly suggest you choose a different type of flooring, maybe a porcelain tile or a smooth honed stone tile. 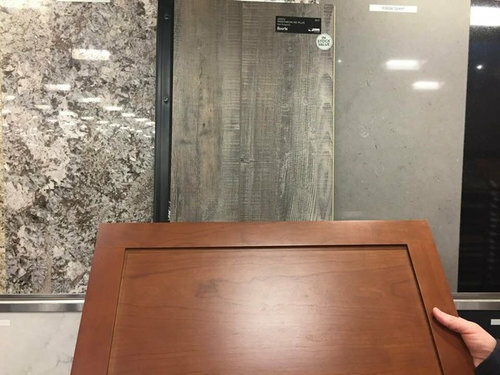 The cabinets are contemporary and refined (fine grain with rich stain) whereas the sample flooring is a rustic weathered look. The grain and style seem to be contrary to each other. I think a minimally patterned / textured tile would allow the cabinets to continue to be the stunning focus of the kitchen. I know... engineered flooring - but what about this look? if it's some cherry and some other? Thank you all for your insightful comments. Pinkmountain, I see where you're coming from on the gray floor... too gray is just too cool for the warmth of cherry. I was hoping my initial floor choice struck a balance in tones, but agree with azlee and everdbz that the overly rustic/grainy one I chose just might not work with the modern feel we otherwise have going on. It's hard to set aside something I really like to make the room look better, but I think that's where I'm at. everdebz -- really like the engineered flooring you gave as an example. Do you all think something like this would work better, color-wise? Or am I getting too yellow with the gray/white counters we've chosen? It's a struggle too, when you want a certain look throughout the house. 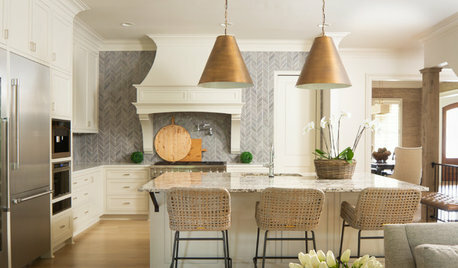 Have you considered perhaps going with tile for the kitchen? 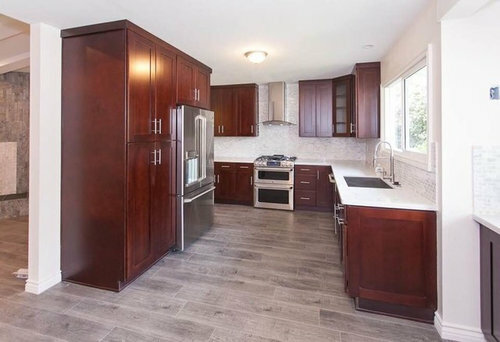 I have a vinyl marble-look tile in my kitchen and wood floors in the dining/living room area, and they blend well and I didn't think they would initially. It's an open concept home so wood and tile can blend if you pick the right ones. Perhaps you can find a very plain tile for the kitchen that blends with the grainy wood floors you envision for the rest of the house. Just a thought. But honestly I think you could pull off your choices, as long as the backsplash was plain. I wouldn't go with a grainy blonde wood for sure. 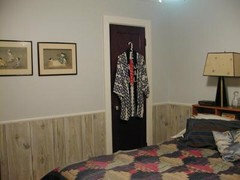 I had a pine floor in my guest bedroom of my previous home, didn't look too great with my reddish brown headboard. Here's some old photos of the room, to give you an idea of how difficult it is to get grey, reddish brown and yellowish woods to play together. My floor initially was reddish brown, old stain. I had no idea it would finish up so light and grainy or I wouldn't have done it. The grey paneling had to stay, it was real wood super glued onto plaster. So this was the bedroom "before." I called it the mudroom. (I did not do the sponge painting, that was the PO's son!) Note how different the floors looked after finishing. Many wood colors, not all playing nicely but looked better in person. Door and bed frame are reddish tones. Note bluish wall color. Not a look you should go for. I went round and round forever on that wall color. 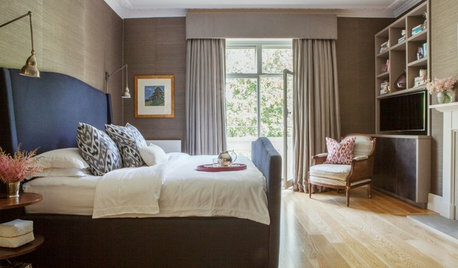 It looked fab with the paneling but not so good with the woods. Yellowish floor with a brown dresser and bluish grey paneling. Battle of the wood grains! your cabinets really look great! The only thing I would push for would be lighter floors and counters. Here are a bunch of dark wood pictures with light floors, some with light counters too. Instead of trying to "match" wood tones, what about a porcelain slate with slight warm and cool variations? Thanks Anthony C! I appreciate the link too. 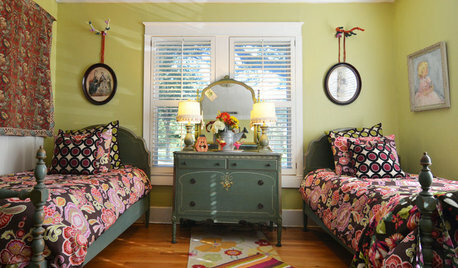 pinkmountain, I see what you're saying about not wanting lots of strong wood colors competing -- thanks for the examples. 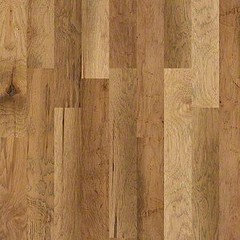 Does anyone have any recommendations on brands/types of luxury vinyl plank? I can start a new thread perhaps with this topic, but just wondering. I'd also be curious if people would recommend against it for any reasons? We have the dogs, which is what is steering us away from hardwood. Kara, will you post a pic of the other space where you will be continuing the floor? Sure d_gw! This is a better shot of the kitchen -- you can see behind the fridge how it wraps around into the other room (front of the house). 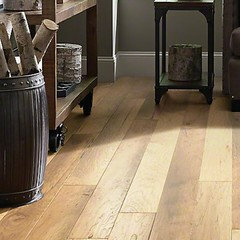 The only vinyl plank floors I am familiar with are Shaw Florte and Monin Flooret. I have samples of the Flooret and atter ookig at them used them under potted plants. Some have been set outdoors during the worst of our winter and they look the same as when I set them out there. I think that may be the most durable product available -- I think it is a lifetime warranty for home use. It looks great from several feet away, but it feels like textured vinyl. We didn't want to put that in a home that was about to go on the market. I think they have come out with a new product since I looked last year -- don't know about that. 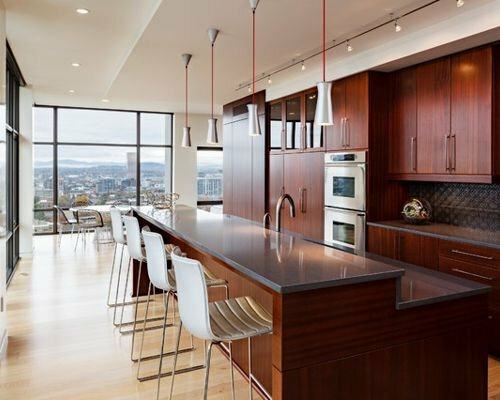 Another question, I guess, would be if Luxury Vinyl is a good option to use in more than just the kitchen. I was planning to carry this flooring into the adjacent room (a living room pictured above). 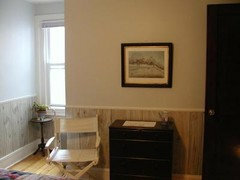 But I'm a little concerned that this material is perceived as only a mudroom/bathroom/kitchen option... is that right? I live in the midwest, so we have very cold winters, which makes tiling that much space very cold. I'm open to hardwood, but again, concerned about the wear and tear with three dogs. AND you can just mop with any kind of cleaner, no buying expensive wood floor cleaners (I just gave away the rest of my BONA!) 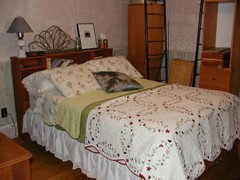 I think you will love all the choices in colors and it is very reasonable in price (about $2.50 a square foot). We are doing the HEATHLAND CHERRY. The Heathland comes in five different colors. I think their FOREST tile in WALNUT would look very close to your inspiration photo floors. 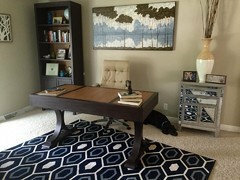 As far as the "cold" issue your lovely area rugs will help and you can also put heating under the tile (since you will be saving so much on the cost of the flooring). I have been walking bare foot between the real wood and tile for five years and I can hardly tell the difference. JMHO, I would not use any grays at all with your beautiful cabinets. There are so many people trying to force gray into the inside and outside of their homes. It does not always work and too often creates a ripple effect through the entire house. We have LVP throughout our second home, a condo. It is a unified look used in every room. I am very happy with it. The area rugs, furniture, art etc. look great with it. I would get flooring with a timeless look. Stick to beiges//Browns, etc. I know this won't wear as well as the LVT, but we discovered that the current bamboo flooring we have (installed by former owners) is actually an engineered wood and it's worn ok, we just don't like the color or texture (prefer something handscraped/more texture). I loved all the tile options you guys shared, but tile in the Midwest winters it's so cold and in a family home, many people are turned off by it, especially throughout a whole lower level. Just wanted to share an update of the kitchen and how it ended up! 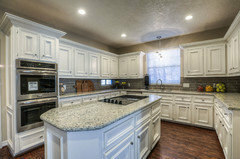 Beautiful kitchen and excellent choices!! Looks great! I love that the floors have a hint of the darker stain and help tie everything together. Thank you so much for sharing the photos. What is the name of the floor you ended up using? It's difficult for me to believe you didn't change the cabinet stain too. What a difference. So light and bright. Bet you love it. That is the perfect choice! d_gw I can hardly believe it, but we opted not to change the flooring once we changed the countertops. The room was already well tied together after all, we just needed a change of paint and something lighter and brighter on the counters to make all the difference! P.S. The floor is a manufactured hardwood bamboo that was purchased at Home Depot! You have proved that taking a project step by step often reveals options you didn’t consider or think would work! So happy for you. Looks great. I upgraded our island granite to same granite as you selected and we love it too! Good job! 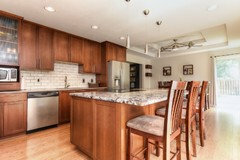 Your kitchen looks amazing- so refreshed and so lightened up. I am still re-reading because it all looks so different but all you did was change counter tops and paint?! Fantastic! It's still hard to believe that is all you did. I hope you don't mind but I am going to post your before and after together. What a great change! I am so glad it worked out for you. Thank you for the update. Gorgeous!! I love every choice you made and it all works together wonderfully. What a beautiful home. I love cherry cabinets so I am so happy that you found a design that works for you so you could keep them. This post is such an excellent example of one step at a time, and how some changes can have an amazing impact. Karaj, would you mind sharing the exact choices you used for the quartz and the granite? Thank you! Sorry, j_leary, did not see this post until two months later.. Probably not helpful now, but the granite (island) was Bianco Antico purchased from Nebraska Furniture Mart. The gray quartz was "Fossil Gray" from the same place. Wow! Quite a change. Hope your move went well. Thanks Flo Mangan -- it was a good move. The new digs have more outdoor space for our dogs and are two houses down from a lake trail, so we are pretty happy! I'll have to do a post with full pics soon. 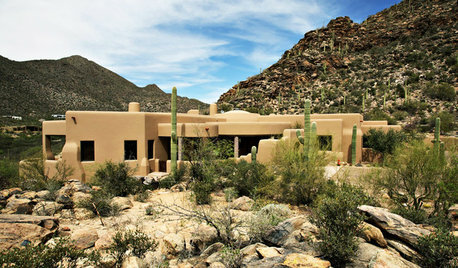 Always love seeing your posts on Houzz! hmmconfused if flooring was changed...no you said?! i like the warmth. 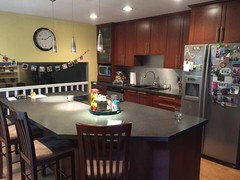 Deb Zilch, no flooring was changed in our kitchen project. The wall color change and the removal of the navy solid surface counters was enough to “change” the appearance of the bamboo flooring. Once we saw the look, we felt updated flooring was not needed. 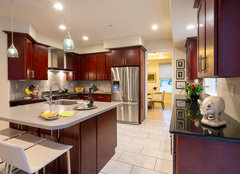 Is natural cherry a bad idea fot kitchen cabinets? where do you toss clothes at night? Oil rubbed bronze or black matte faucets?